"I'm running bad," is a phrase you will often hear poker players use to describe periods of bad luck or variance. In poker, it sometimes just feels as if the cards are conspiring against you and that you can't win a hand. These periods can go on for weeks or even months, resulting in your bankroll taking a nosedive. 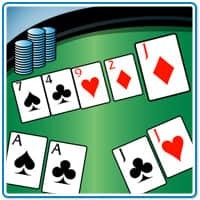 Such periods are often referred to as variance or "poker downswings" and every player, from the micro-stake grinder to the WSOP Main Event Champion, will go through them. The human mind is a little bit pessimistic and seems to notice bad luck far more than it notices good luck. If you are holding a pair of aces and get all your money in the middle before the flop, you expect to win. After all, you are an 80% favorite. When you do win you will not consider yourself lucky, but rather put it down to the skillful way you played your pocket rockets. However, the truth is that you escaped the 20% chance you had to lose the pot. Your opponent still had a chance to beat you, but didn't. So you got lucky. But I am your memory is far clearer on the times your aces were cracked, rather than the times they stood up. But the truth is that you escaped the 20% chance to lose the pot. Your opponent still had a chance to beat you, but didn't. So you got lucky. But your memory is far clearer on the times your aces were cracked, rather than the times they stood up. Even though poker is a game of skill, it is still a game with a random element in it. You will undoubtedly continue to experience variance in poker throughout your career. 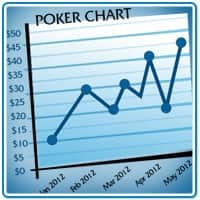 Poker analysis software such as Hold'em Manager and Poker Tracker 3 will show you graphs that plot your expected value (what would have happened if you had gone all-in before the river with your hand) against your actual winnings. You will often see a fair sized gap between those two lines. Sometimes you may be having a lucky streak and your winnings are higher than your expected value, and sometimes your winnings will be below the line because you are having bad luck or running bad. This is simply due to the variance in poker. Are you playing opponents that are highly skilled? If so, you will expect your win rate to drop because of the increased difficulty of the game. This can make a streak of bad luck very costly. Did you increase the level at which you normally play? If you have just jumped from $.5/$1 NLHE to $1/$2 NLHE, then you are going to see wild variances in your poker earnings because of the jump in the money involved and the skill level of the players. Are you on tilt? If so you are probably throwing money down the drain as a result of bad decisions. It doesn't matter what cards you are holding or how good your luck is, when you play on tilt you always lose. You need to play a lot of hands before you can get a clear view of your poker playing skill and allow the odds and percentages time to even out. How many hands? Well most poker players would tell you at least 100,000 and preferably more. Some experienced players will say they would not judge another player's success without seeing their stats after a million hands. The first chapter in Charley Swayne's book Advanced Degree in Hold'em suggests playing 250,000 hands before you even begin to play for cash just to get a "little" experience under your belt. While most people will never play that many hands on the free money tables, it is definitely a good idea to start at the lowest levels before moving up. The more you play, the more the law of averages will even out and you will be able to determine with greater accuracy how much you are winning because of your skill and how much you are winning because you went through a lucky patch. The reverse is harder to determine, because we often put down losses to bad luck rather than bad play. For example, you are holding AJ on the button and raise three times the big blind. The player on the small blind re-raises you. He has been a real nit all night, but you have just lost a big pot when your bullets were cracked by JJ after another fish hook fell on the river and gave your opponent trips. You are eager to get your money back and shove all-in. Your opponent calls and flips over KK. The cowboys hold up until the river and you bemoan the fact that Lady Luck couldn't give you an ace "just one time". The truth is, if you had stopped to think, you would have realized that the nit was unlikely to have anything less than kings and you only had one live card at best. By analyzing play over the long term, you can gain a clearer picture of just how much of your poker variance is down to luck, and how much is down to your strategic decisions. Poker needs time to let the randomness iron itself out, so keep your eye on the big picture. This is one of Columbus' famous 32 rules for survival in the movie Zombieland, but it also holds true for survival at the poker table. The small things in poker: stealing blinds, the occasional well-timed bluff, continuation betting and checking at the opportune moments, are what make us the most profit in the long term. While the individual profits from these maneuvers are often small, over the long haul these small pots accumulate into a sizable sum. It is these little spots where you can save a little money and make a little extra, and it is these that will ultimately push your bankroll into profit and make you a consistently winning poker player. 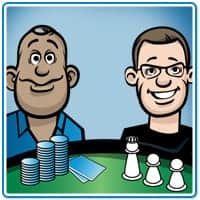 So when you are going through a really rough stretch, what you should be doing is looking at whether or not you are playing a fundamentally strong poker game. Playing solid poker is something that is within your control and will enable you to pick up these small wins that bring big profits. We will always use our win rates as our poker measuring stick, but you should not let yourself get disheartened when your prayers to the poker gods go unanswered. Remember, downswings and variance happen, poker is a long journey and you should spend a little time enjoying the scenery along the way. Keep your game focused and solid, pick up the small pots when you can and ensure you are always making the best decisions possible. Poker is a game with an element of randomness. It is not chess; so enjoy the little things.